I recently picked up 4 new lipsticks from the AW16 Shanghai Suzy collection. This isn't my first purchase from them and to be straight up with you I'm a big fan of the brand. Shanghai Suzy is a lipstick only cosmetics brand with a new range coming out each season. Each colour is limited edition, not tested on animals and vegan-friendly (they contain no animal-derived ingredients). Each shade I picked uses the Whipped Matte formula - it's basically a matte finish without the typical dryness of a matte lipstick. The lipsticks are all creamy to apply with a great pigmented colour and I found them to last a good 4-5 hours before needing to reapply. An added bonus to these lipsticks is the scent. Whilst previous ranges have been scented with grape this new range smells like strawberries and is just delish! 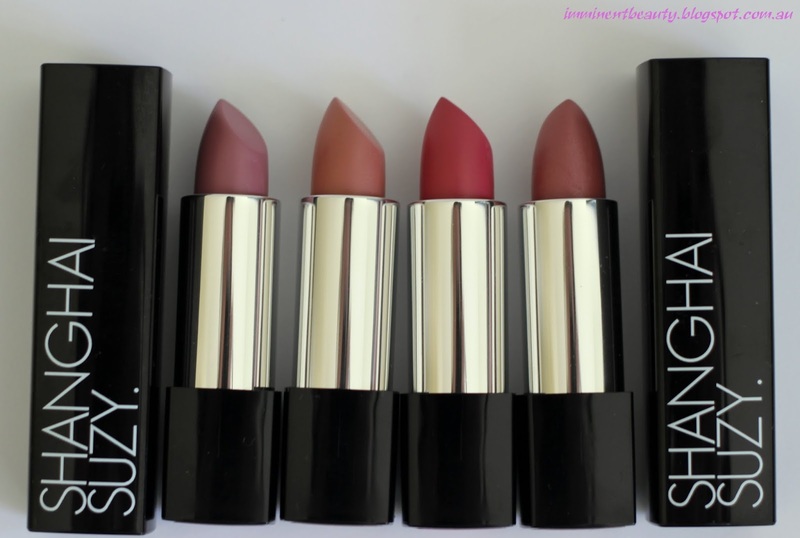 Priced at $14.95 it's perfectly reasonable to pick up a couple of new lipsticks each season without feeling like you're blowing your budget and in my opinion the formula is comparable to much higher end brands.